Iâ€™ve bought a number of the PV Electronics kits over the past couple of years, including several QTC and IN-12 kits, and am consistently impressed with the quality of the kits. The instructions are clear, the boards and components of good quality, and help is at hand from Pete if you get stuck. The QTC quick tube change feature is a great idea allowing you to swap out tubes with the same nixie clock kit to find the tubes you like best. You just need to buy separately the boards for the other tube types (I have changed between IN-8-2, Z573M and IN-14 tubes with the same clock kit). Also, if you mess up soldering in the tube you don't have to de-solder it from the main board and potentially also mess that board up. One feature that a number of the PV kits have, including the QTC kits, is â€˜weekday awareâ€™. This is a really useful feature that allows you to shut down the tubes for a selected period during the day on week days, when you are at work, or at the weekends, and helps prolong the life of your tubes. Most other kits and ready-made nixie clocks available do not have this feature. I have also bought GPS receivers for the clocks. These are a really useful additional feature that save you having to manually set the date/time on the clock. When you go away on holiday and switch off your clock, when you switch it back on again on your return the GPS receiver will automatically set the clock to the correct date and time. 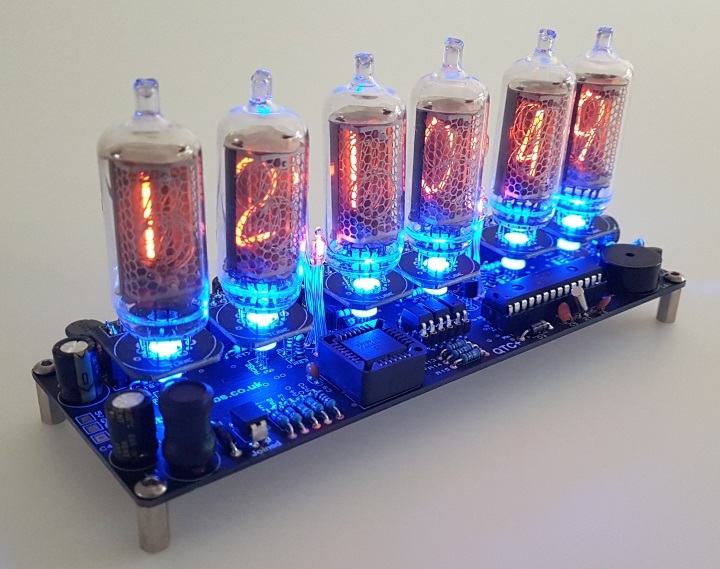 I unreservedly recommend the QTC nixie clock kits from PV Electronics.